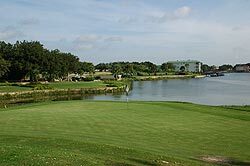 Horseshoe Bay Resort in Horseshoe Bay, Texas - just a short distance from Austin - is an award winning golf resort featuring luxurious villa accommodations in The Waters at Horseshoe Bay Resort and Four Diamond AAA hotel & condo accommodations in the Horseshoe Bay Resort Marriott. This property features the full-service Bayside Spa and Fitness Center, a 24-hour workout center, four swimming pools, volleyball, twelve tennis courts (six lit for night use), an activity center with table tennis, fooseball and video games, a private sandy beach, and a marina with a wide variety of water sports available. The dining options at Horseshoe Bay Resort include country club dining overlooking Lake LBL, the Lantanna Grill, the LaBahaia Restaurant, and a variety of poolside grills. Also on property is a Market and well-stocked Tennis Shop and a private airstrip. 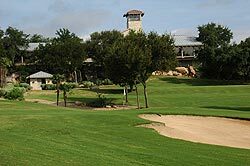 Three 18-hole championship golf courses are on property that take full advantage of the Texas Hill Country landscape - each designed by Robert Trent Jones, Sr. Slick Rock, Apple Rock and Ram Rock are available for play by guests of the Horseshoe Bay Resort. 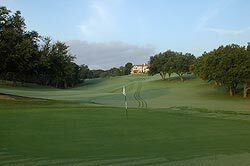 Two Pro Shops at Horseshoe Bay Resort offer a wide variety of quality golf attire, clubs, balls and paraphernalia. The practice facilities include a complimentary range, short game practice area will putting green, chipping green and practice bunker. PGA Professionals are on staff and offer a selection of private lessons and clinics. Each clubhouse also features light dining fare and gorgeous lounge facilities. 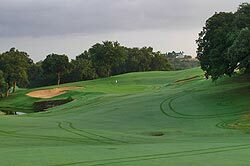 A unique feature of the Horseshoe Bay Resort is a multi-million dollar 18-hole, par 72 Bermuda grass putting course. 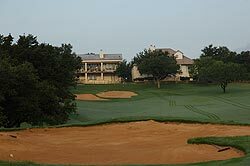 Located next to the Marriott Hotel, it is designed like a regulation 18-hole golf course, complete with fairways, bunkers, and water hazards. This lushly landscaped course boasts a collection of exotic birds, cascading waterfalls and lavish rose gardens. 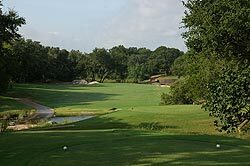 Apple Rock, Horseshoe Bay Resort's third championship Robert Trent Jones, Sr. course, was completed in 1986 and received distinction as "Best New Resort Course" by Golf Digest. 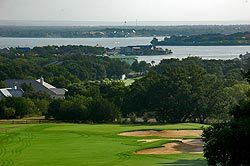 This is perhaps the most scenic of the three Horseshoe Bay Resort courses with the front nine offering a roller coaster ride through the picturesque Texas Hill Country and the back nine offering holes with panoramic views of Lake LBJ. The elevated greens are Tif-Eagle while tee boxes and fairways are 419 Bermuda. 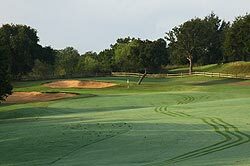 Fifty-six bunkers dot the fairways and protect the greens - most are fairly large but not overly deep or and penal - and water comes into play on 5 holes. 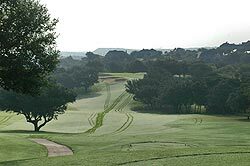 Four sets of tee boxes with distances measuring 6,999 yards, 6,536 yards, 6,038 yards and 5,536 yards have slope ratings of 128 to 136. 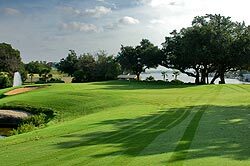 Despite its high slope rating, this course is manageable with proper club selection and well-placed drives. Ample landing areas are available for most tee shots, but the up-and-down nature of the terrain can create difficult approach situations. 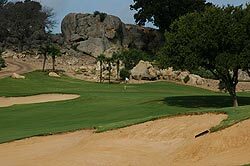 Apple Rock at Horseshoe Bay Resort is definitely one course you don't want to miss while visiting Texas Hill Country. Like the other courses at the resort - you have to stay to play - but you'll be glad you did! 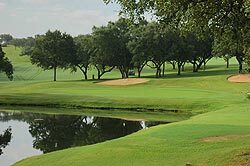 Three unique courses, , wonderful service, comfortable surroundings and elegant accommodations are just a few more reasons that Horseshoe Bay Resort is a true Texas golf destination. We highly recommend it! For more information on Apple Rock at Horseshoe Bay Resort - click here.